A storm system is about to have a violent trek across the eastern half of the country. This is the same low that brought blizzard conditions to all of Wyoming earlier in the week, but now it's headed for warm, moist conditions ripe for severe thunderstorm development. The first threat of severe weather is across parts of the Southern Plains, Southeast and even the Midwest, but the main bulls-eye lies across northeast Texas and the Louisiana-Arkansas border. By Thursday, the threat moves east and covers most of Mississippi. And on Friday, the threat slightly weakens and moves into Alabama, Georgia and the Florida Panhandle. 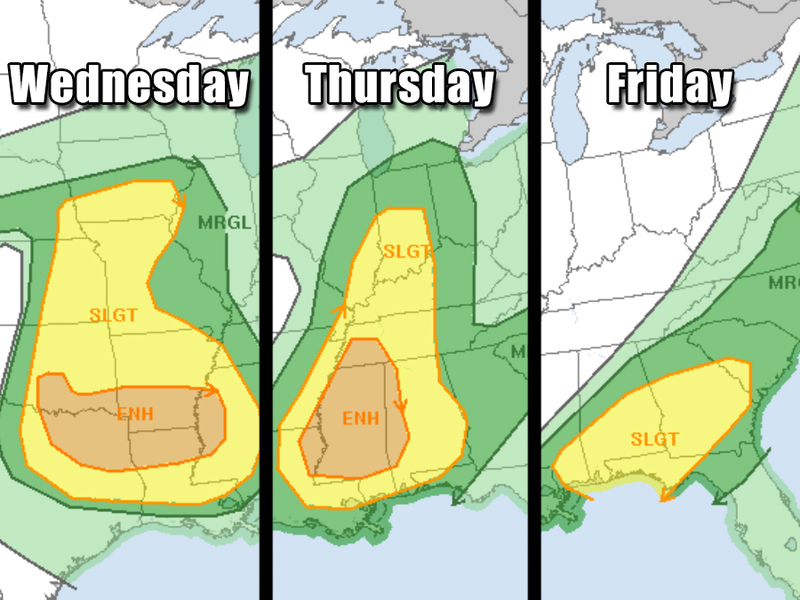 The second half of this week likely will be riddled with reports of strong winds, large hail and even tornadoes. Before these storms develop, it's best to have a plan in place, so you know where to go and what to do. The Storm Shield App can alert you when severe weather is about to hit your location , giving you the most time possible to get to safety.